A RENAISSANCE FOR THE "CITY OF DESTINY"
Train and sea travel initially drove Tacoma's growth. The Northern Pacific Railroad chose Tacoma as its western terminus in the 19th century, connecting trade and passengers to its deep-water harbor. Today Tacoma is the second largest city in the Puget Sound region, and the Port of Tacoma is Washington's largest port and a major center of international trade. The City of Tacoma is keen to capitalize on the influx of new residents searching for alternatives to an increasingly expensive Seattle, as well as the year-over-year enrollment gains at University of Washington's Tacoma campus. Spending on public spaces and art initiatives, as well as generous business incentives, make Tacoma one to watch. The Town Center brings $125 million of private development to downtown. Phase 1, planned to open in 2019, will create 350 residential units, over 200,000 SF of retail space, 450 parking spaces, and a wine tasting shop. Phase 2 will add another 180 residential units, 50,000 SF of commercial/office space, 185 parking stalls, and a luxury grocer or cinema. Bringing 102 foreign investors to the region, this $85 million, 300-room hotel project is a major vote of confidence in the the future of the city. The finished hotel will feature a swimming pool, 10,000 SF ballroom, meeting spaces, and street-level retail. The project will create more than 1,600 jobs, with completion planned in 2020. Pre-construction is underway for the Tacoma Link Extension project which will extend the current system north along Commerce Street to the Hilltop District via Stadium Way, North 1st Street, Division Avenue and Martin Luther King Jr. Way. The project will create seven new stations and aims for completion in 2022. The $170 million budget is financed through a mix of tax dollars, federal grants, and City contributions. 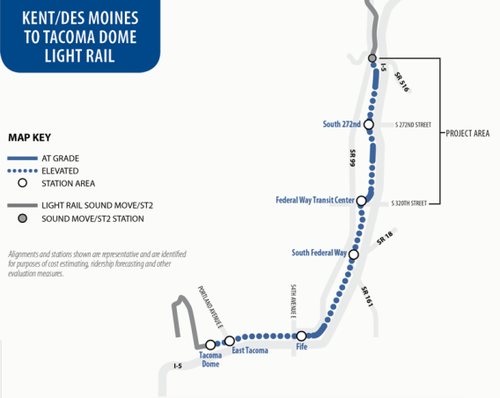 The Sound Transit 3 expansion will expand Light Rail service to connect the Federal Way station to Tacoma. Once completed, riders will have uninterrupted access to Seattle, SeaTac airport, and the Eastside. The project includes construction of four new Light Rail stations and a pedestrian bridge connecting the Tacoma Down Station to Freighthouse Square.